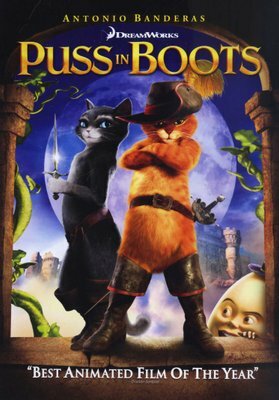 Everyone knows Puss in Boots from the Shrek films, but years before meeting the green ogre, the swashbuckling feline had his own animated adventure. 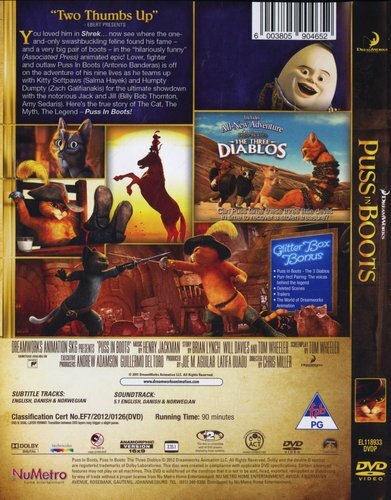 Learn the origin of the furry lover, fighter, and outlaw as he teams up with Kitty Softpaws and Humpty Dumpty to steal magic beans from the dastardly Jack and Jill in a castle guarded by giants so Puss can clear his name. Winner of an Oscar – amongst other international awards – this computer-animated action comedy is very funny indeed! You may wonder (as I did when watching it for the first time,) why the plot suddenly jumps from a sort of Zorro beginning to the “Puss in Boots” story; on to “Jack and the Beanstalk”...and then back again. The reason given is that Dreamworks and Paramount Studios had intended its being yet another Shrek movie; but changed their minds amidships somewhere. Antonio Banderas, as Puss-in-Boots, re-creates the cat character he had created in the more recent Zorro films. Kitty Softpaws (Selma Hayek) provides the romantic interest, while Zack Galfinakis is briliant in playing the voice of Humpty Dumpty; presented here as a Bad Guy! Interestingly enough, Jack and Jill ((Billy Bob Thornton and Amy Sadarkis) are now married – are also Bad Guys here. For what its worth, the title was changed for different countries of the world, for reasons that I personnaly can't figure out! All in all, a pretty good family movie! Also available in 3D, on Blue-Ray.